Moscow and Tokyo are again at odds over the decades-long Kuril Islands dispute. Is it time to finally settle this issue, and will the two nations finally let bygones be bygones? 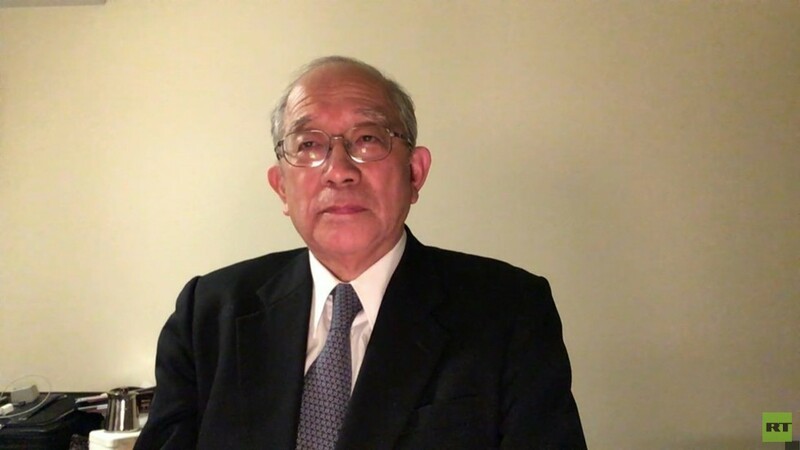 We ask former diplomat and negotiator in the Kuril Islands talks Dr. Kazuhiko Togo. Sophie Shevardnadze:Dr. Kazuhiko Togo, ambassador and former negotiator in the Kuril Islands talk – welcome to the show, it’s really great to have you with us. The hottest topic of the day for Japan and Russia. Prime Minister Abe has sworn on his father’s grave to do his best to put an end to the dispute around the Kurils. What do you think? Has he asked too much on the issue? Will the potential failure on his front lead to his downfall as the leader of the country? Do you think he’s staked too much on the issue? Kazuhiko Togo: Well, as you know, Prime Minister Abe and President Putin made a joint press interview, and as far as I can judge, I think that the two sides – both the Russian side and the Japanese side – are equally serious in pursuing the negotiations, not in a way to enforce one’s will to the other, but with the spirit of pursuing a mutually acceptable solution, and I think that was a fine way of conducting the negotiations. SS: Sure, but as this point both Russia and Japan are staunch in their approaches to the Kurils. Moscow says Russia’s sovereignty over all four islands is out of question, since it would put the results of WWII in question. Tokyo sees the islands as occupied territories and wants them back. It seems like these are two irreconcilable positions. What is the point of this flurry of diplomatic meetings and conferences if the main issue seems to be set in stone for both parties? KT: Well the original positions of both, as you’ve mentioned, naturally vary from each other, they’re distant from each other. But the point of these negotiations is that both sides are trying to find a mutually acceptable solution, and if you have listened carefully to the outcome of the press interview, both sides have agreed that they’re going to do their best in order to find this mutually acceptable solution. At this point, I don’t have anything to add. Let the president and the prime minister and the two foreign ministers and their representatives do their best in order to find this mutually acceptable solution. SS: But also, I’m thinking this issue of the Kuril islands – it’s been there for the last 70 years. Shinzo Abe says this dispute should be solved – now or never. But if the two nations managed to coexist through decades without, you know, settling the island issue, why the rush now? KT: Prime Minister Abe already for six years continuously sends the message that this is an issue which you, President Putin and myself can resolve if we are determined. And, as you may know, Prime Minister Abe is sort of the prince of the Japanese conservatives. He has the right, he has the power to make concessional decisions, and as you mentioned, we have been negotiating this already for 74 years. Taking into account Abe’s position in Japan and taking into account the position of the two countries worldwide, I think this is one of the best ways and the best timings to resolve this issue which has been haunting us for 74 years. SS: Opinion polls show that 75% of the Japanese would only welcome the peace treaty if Japan gets all four islands, and in the best-case scenario Russia is prepared to discuss two. Seeing how the Japanese people are all riled up about it, would a no-deal with Russia be better for the general public in Japan than a compromise? KT: I do not know where your opinion poll came from, but to my knowledge Prime Minister Abe’s decision or public statement – that now we have to resolve this issue which has haunted us for 74 years – in general is taken positively by the Japanese people. That is my understanding. But how to resolve it now we do not know exactly, what will be the final solution, what will be the final format, and we are going to wait until this result will come out through the leaders and the two foreign ministers and their representatives. But let us be patient and wait to see what will be the outcome of these negotiations. SS: There’s the historic value; the islands are also geostrategically important to Russia, they work as a buffer between Russia and the Pacific, and foreign presence there could hamper its access to the ocean. What is Tokyo ready to offer to make up for all this? KT: You have to analyse the situation one by one and see what the final outcome will be. The common sense tells us that if we are going to find some solution which would endanger Russian security position, I don’t think this will come out. So, the two sides have to come to a solution which will not create strategic harm to the Russian security position. That is common sense, and I’m sure that if the two sides will do their best effort, they will be able to find that kind of solution – at least, that is my view. SS: So, under a treaty with the United States, Washington has the right to have military bases on the Japanese territory, and an American base on the Kuril Islands is something Russia isn’t prepared to get. So, if Japan does obtain any of the islands, how can it balance out Russia’s security interests with commitments to its alliance with the United States? KT: I think your understanding of our security agreement with the United States is not necessarily accurate. Naturally, Japan and the United States have this security agreement, and we’re going to discuss with the Americans where best to put the American bases, if necessary. It doesn’t certainly mean that the Americans have the prerogative of allocating their bases wherever they want to. They need permission by the Japanese side. So, it is up to the negotiations between Japan and the United States. If there is some kind of an agreement, I’m convinced that the security bases question between Japan and the United States will not appear and will not hamper the possible agreement between Japan and Russia. This is also based on sheer common sense and on the structure of the security agreement. SS: OK, common sense I understand but it doesn’t mean much when said in words, also pledges don’t mean much in the long term, and the Russians have learned their lesson with NATO. So what concrete guarantees can Japan provide to Moscow to rule out the US presence on Kurils for good? KT: This is exactly the point with the president and Prime Minister Abe and their colleagues are going to be discussing. I’m sure that they will find a satisfactory format on the basis of which the Russian side will find it trustworthy. You see, Japan and Russia now are trying to conclude the peace treaty. That peace treaty should be based on the mutual confidence, mutual trust. If trust does not emerge through this treaty, I think it is very difficult to foresee a possibility of conclusion of the peace treaty, and precisely this issue will enter into the scope of the trust which we are now going to create between the two countries. SS: So, I remember the last time when Japan offered Russians a deal with demilitarised islands – that was in the 50s – United States politicians went up in arms and sabotaged the negotiations. So, if the same deal comes on the table now, what is stopping the Americans to put pressure on Tokyo and, you know, scuttle it again? KT: Talking about the situation today, Japan is an independent country, we held this security agreement with the United States and we have built a certain amount of trust between each other. I am sure that Prime Minister Abe would be able to tell the Americans that the peace treaty with Russia has a vital importance for our nation and that this will create further trust between Japan and Russia, which will strengthen and improve the general situation of trust in North-East Asia, which will ultimately benefit America. I am sure we will be able to convince the Americans that that is the primary outcome of this security treaty. And as for the concrete details which might appear in this context, the negotiators will discuss and will find an appropriate solution. SS: Do you think the Russian-Japanese rapprochement can put Tokyo in a position to act as a middleman between Moscow and Washington? KT: Well, you know, I don’t think you can expect that something of this kind will appear immediately. But in the long run, if Japan and Russia would be able to create real relations of trust with each other, I am sure the message which Japan will tell to the Americans – “this is the aspect that you, Americans, should listen to more carefully” – I am sure this kind of message would become more penetrable to the Americans. So, at least in the long run, the word “middleman” that you mentioned may not be the right connotation, but Japan would be able to play a useful role in order to decrease the tension between the United States and Russia. I am really convinced. SS: Now, Japan, a nation without an official standing army, now seems to be bolstering its military capabilities. Do you see a time where it can stand up for its interests on its own without having to rely on the US for its security? KT: In the long-term perspective? SS: Yeah, do you see any time in the future? KT: Well, if you look at the change of the structure of security relations between Japan and the United States, I’m sure you can observe that Japan is now increasing its position of self-standing, and the primary achievement which Abe has made in the last six years was to have strengthened this position of self-standing, and this is the long-term direction which will be supported by the Japanese people in the now, and what I have said is maybe contrary to the impression you are getting from the media, but that impression,let me say, is wrong. SS: Do you think a shared use option of the Kuril Islands would work for Japan, a deal where Japanese companies get a special legal status under Russian law when operating on the islands or explore resources jointly with the Russians? Is formal sovereignty over the islands a matter of principle for Japan and Prime Minister Abe? SS: I’m sorry to interrupt you, doctor, but my question was a little bit different. My question was – do you think that Japan would agree on this, you know, joint use of islands, shared use of islands? Could that be an option? KT: Well, “joint use” is very vague statement - “joint” in what level, in which category, and after the fundamental issue of sovereignty is decided, in whatever way, Japan and Russia have to live and work peacefully on the islands, sharing as much as possible of interests and the format, which they can agree. But always respecting the sovereignty decision. SS: But look at it this way, doctor – maybe a shared status would mean that Japan gets its foot in the door, and that eventually that would lead to Japanese ownership of the Kuril Islands, like in another seventy years? KT: Well, you are talking about a scheme which we do not know anything about. But I said that the sovereignty decision is important, and after the sovereignty decision is made, the two sides have to work out the kind of joint cooperation which would be acceptable to both. I don’t understand why you are sort of figuring out that kind of impossible solution which certainly will not be accepted by one side. We have to work out our joint activities which will be acceptable to both of us. You have to be realistic, you follow me? SS: I want to talk about sanctions a little bit, because Japan’s own sanctions on Russia are pretty much the most moderate that are out there. Do you think the thaw between Moscow and Tokyo could lead to their complete removal, or are they symbolic enough to not pay attention to them at all? KT: Well, along the six years of the negotiations between Abe and President Putin two years have been, you know, wasted because of the sanction issue. First, you have to recogniSe that despite the sanction issue, now the two sides seem to be very sincere in trying to do their best in concluding a peace treaty. Now, if the level of trust isbe high enough after the conclusion of the peace treaty, I think that a kind of decision which would meet the level of trust should come out, but in concrete terms how it will come out – that will be left in the decision at the highest level, and I am not in a position to disclose to you what that would be. SS: I just have one more question about the sanctions, because I know that Japan is one of the nations that have been exempted from the embargo on Iranian oil imports, again because of how badly it depends on imported fuel, I guess. Could it work the same way with the sanctions on Russia? KT: As I said, you know, the decision which will be taken when the level of the trust between Russia and Japan will be high enough through conclusion of the peace treaty, what will be the final decision to be taken by my prime minister and how he will talk convincingly to the American side, you know – this issue will rest at the highest level. And I hope that situation will not be entirely the same as today, but this is the maximum I can tell you, and we have to wait to see how the negotiations will proceed in the future. SS: Earlier in January there was a Japanese representative that was PM Abe’s aide – he claimed that the possible Japan-Russia peace treaty is a means to counter the threat from China. So, if there is actually a threat from China to Japan, then shouldn’t the peace treaty be agreed upon quickly and not get bogged down in haggling over islands? KT: Well, I do not know exactly the statement you mentioned, but my view is that relations between China and Russia are very important relations for Russia, and Japan has certainly no intention to intervene or to sort of undermine these relations. So are our relations with China, and I’m sure that the Russians have no intention to intervene into our important relations with China, which, I acknowledge, have several potential difficulties, but relations between Russia and China are in an extremely good situation. Let it be so! It is in the interest of Russia and in the interest of China – that doesn’t bother us at all. SS: But do you know the question that the general public here in Russia is asking, right, because Japan and China have their own islands dispute going on; but if Japan wants Russia to give islands back and enjoy good relations afterwards, why doesn’t it do the same with the Senkaku Islands in the South China Sea? That’s what people are asking over here. KT: This view is based on,let me tell you frankly, total ignorance of the past history of these two islands’ issue. Now we are doing our best with the determination to make maximum compromise to reach an agreement with Russia, and I think this will be good for Japan’s international status, and I think this will be good for Russia’s international status, and the relationship between Japan and Russia based on this trust of concluding the peace treaty will benefit us both. Now, we have an entirely different history on Senkaku, but my hunch is that with Japan’s more elevated situation in international relations by way of concluding the peace treaty with Russia will have a certain impression on how China will treat that. I think this will still improve the relations between China and Japan as well. SS: Alright, ambassador, thank you very much for your interview, thank you for your invaluable insight on this issue. We’re going to wait and see what happens and hopefully both sides will hammer out a deal that is acceptable for the two countries. We were talking to doctor Kazuhiko Togo, ambassador and former negotiator in the Kuril Islands talks, discussing whether Moscow and Tokyo can reach a compromise in a decades-long dispute.